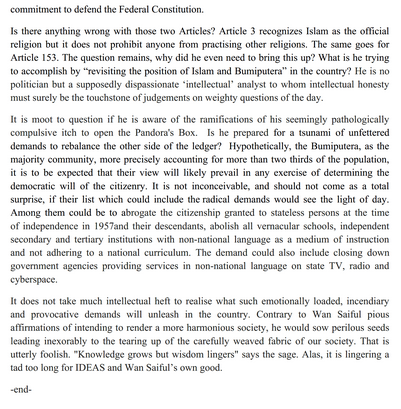 I think this 1 Saiful is not above the law. Is he? Why can't we entertain the thought that the clauses can be scrapped in 10 years? After all it was supposed to be just 15 years after 1957 and then it was for review. This extension is a result of the review. And then it was extended again and again. 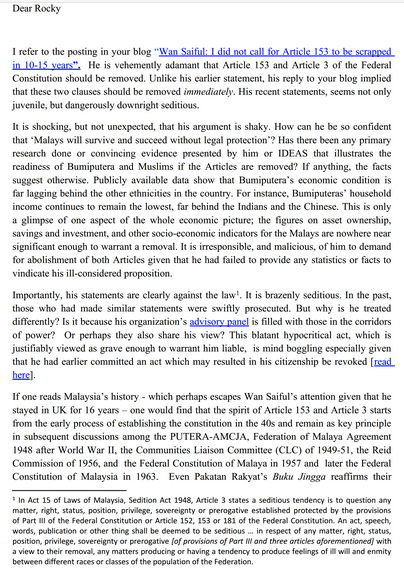 So if the Malays can stand on their own feet in 10 years, why cant the articles be amended or removed? Is it a crime to entertain such thoughts? Well, if they want to boot out every Malaysian who questions the status quo.....it just goes to show the fundamental insecurities that have bedevilled us in the past and that are doing so now. It's as if proving loyalties is reduced to race and ethnicity. And I guess the witchfinders and devil hunters are following in the footsteps of the Inquisition. Burning at the stake, anyone? What the govt should do is to get pemandu do a thorough research say 5-10 years. Recruit saiful n all those liberal thinkers as sampling. Let see the results if these sampling can really stand on their own without the act. Negara pimpinan org yg tidak tegas akn jadi beginilah....pemimpin yg asal dr dlm guni beras...hidup senang tidak tahu susah rakyat bawahan..mewah dan elite dr day one.ahirkan...apa yg mereka tahu keperitan hidup rakyat...mereka hanya ada nama bapa bapa mereka sahaja utk diniagakan kpd rakyat..
jangan bagi muka! revoke dan ini termasuk pada semua yang berpaling tadah dan musuh negara. Don't interchange the use of Malay and Bumiputra at your whims and fancy la. Malays are far ahead of the Indians, its only when you guys, for convenience, use 'bumiptra' statistics that shows the lagging behind. And everyone knows its because it includes the completely ignored 'non Malay' bumiputras. Who are you trying to kid using awang selamat logics.